Almost everyone knows the story of the Great Flood and Noah and his family’s rescue in the Ark. There are children's books, toy arks, cartoons, advertisements and much more. Yet fewer and fewer people know exactly what the Bible writes about the Great Flood in Chapters 6 through 9 in the Book of Genesis. • The fact that exactly eight people were on board. • The fact that the Ark was surprisingly large. • The fact that the highest mountains were flooded. The Bible tells us very precise details about the many events during the Great Flood. Is the story of Noah and the Great Flood, a historical event or just a religious fairy tale? Today, most people do not believe that a worldwide flood, as described in the Bible, has ever actually happened. The most popular opinion - even among theologians – is that the first chapters of the Bible were written during the Babylonian captivity in the 6th Century before Christ. It is thought that the story of the Great Flood was inspired by flood legends from Babylonian literature which coincides in many details with the Bible. Alternatively, one can argue for the credibility of the Bible: The story of the Great Flood from the Bible and similar testimonials from other cultures are different versions of a reported incident that actually took place. Yet a global flood as mentioned in the Bible in which even the highest mountains were flooded (Genesis 7:20), is hard to believe for many. However, if in fact the first chapters of the Bible are to be taken seriously, then other considerations must consequently be included in the argument: First of all, the scientifically determined geologic time scale of over 4 billion years must be considerably shortened in order to explain it within a biblical account of Creation and early history instead of the Theory of Evolution. Geological processes, that take place in a short geologic history, warrant the assumption that the high mountain ranges of the Himalayas, the Alps, the Andes, etc. did not exist in their current form in the time of the Great Flood. What could the world have looked like before the Great Flood? The landscapes of the world before the Great Flood are only defined briefly: »Eden« (Geneses 2:8), »Euphrates«, »Tigris«, »Assyria« (Geneses 2:14), »Nod« (Geneses 4:16), or the city »Enoch« (Geneses 4:17), here we encounter a few geographical specifications, of which the most well known still lead us to place the world before the Great Flood in Mesopotamia or in north-western Iran, as suggested by various expounders. But despite the archaeological evidence which could lead to such assumptions, the geology can not be ignored. Mesopotamia consists of geologically young alluvium (»era: Quaternary«) that, according to the most common scientific interpretations of Creation, was deposited after the Great Flood. The ancient river courses and cities must have, therefore, run very deep below the present land surface - or in a very different geographical environment. The geologist Manfred Stephan believes that before the Great Flood the humans lived in »non-traditional fossil habitats«. Therefore, there are no archaeological remains of antediluvian people nor are their fossils to be expected, because the settlements must have been irretrievably destroyed during or after the Great Flood: Either thick layers of rock were deposited there or the inhabited surfaces were eroded by the great water masses. How can a global flood be reconciled with geological scientific findings? For centuries, geologists have studied the structure of the earth's crust and discovered that it consists of crystalline bedrock, which is covered with several layers of sediment that sometimes contain fossils. The use of Darwin’s Theory of Evolution, solidifies the theory that these layers of rock are to be assigned different time periods in which they formed within millions and billions of years. The earliest layers of rock contain no fossils and are called »Precambrian«. With the Cambrian and the so-called »Cambrian Explosion« the »Palaeozoic« era began, with its fossilized proof of prehistoric life that seemed to have emerged very suddenly. The beginning of the Cambrian era is dated back to a time before 542 million years ago. The best-known geological period is the »Mesozoic« era with its three periods »Triassic«, »Jurassic« and »Cretaceous«, which especially became famous through the dinosaur finds. If we want to interpret earth’s history from a biblical perspective, we must then consider, for example, Romans 5:12 »Therefore, just as sin entered the world through one man, and death through sin, and in this way death came to all people, because all sinned.« Or Romans 6:23 »For the wages of sin is death, but the gift of God is eternal life in Christ Jesus our Lord.« In consequence, it can be deduced from these verses, that before the fall of mankind there was no death on earth and therefore, no fossils could be formed. This means that since the Cambrian period all fossil-bearing layers could only have been formed after the fall of mankind! The obvious conclusion was then to assume, that all the deposited layers of rock were formed during the year of the Great Flood. However, there are some profound arguments that speak against this assumption: Several layers of rock show evidence, that at certain time periods it must have been dry - during a single year of deluge there is no explanation for such interruptions. There are also geological phenomena that require a certain amount of time to develop: not necessarily millions of years, but also not just a fraction of a flood year either. What speaks against a development within one year is the actual existing and world wide correlation of sub-categorisation of the layers through the various fossil species. The formation of this sequence under the turbulent conditions that must have prevailed during the flood year is inconceivable. The final solution to this dilemma and contention between the Great Flood and geology is still pending, but currently a biblical prehistoric model is being proposed that assumes powerful geological activity occurred before, during and even after the Great Flood. One possibility is, for example, the presumption that the Great Flood happened after the »extinction of the dinosaurs« in the Tertiary period. This would suit the assumption that some of the dinosaur survivors of the Ark became extinct shortly after the Great Flood due to climate changes or, did not reproduce in sufficient numbers. When and where did the Great Flood take place? The Bible does not mention the place where Noah lived and built the Ark. The Epic of Gilgamesh, however, speaks of the city Suruppak, which could also be identified archaeologically. It lies 200 kilometres south-east of Baghdad in modern day Iraq. However, if the Great Flood had geological dimensions, one must assume that the earth's surface changed significantly during that time, and that many geographical specifications from before its occurrence have possibly been transferred from memory only into the new landscape. Perhaps the biblical authors were more consistent, because they did not want to confuse Noah’s descendants with outdated geographical specifications related to the deluge. The Bible mentions the »Mountains of Ararat« as the place the Ark came to dock and hence, the source of new life on Earth. Ararat corresponds with some certainty to the land »Urartu«, which was located north of Mesopotamia and is also know through cuneiform scripts. 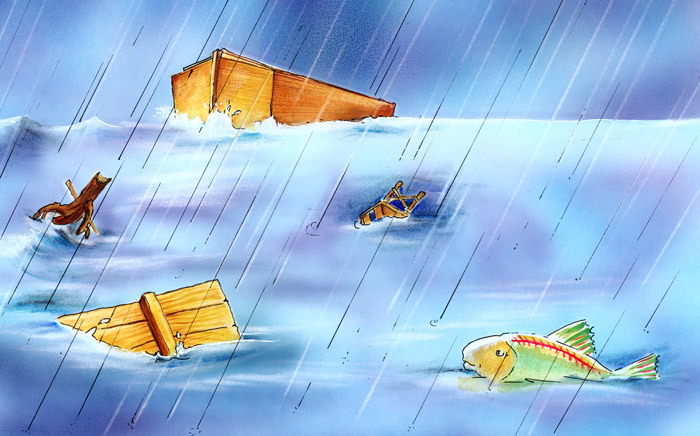 Most Christians now believe, that the Ark must have come to rest on the famous »Great Ararat«, about which sensationalized reports of alleged Ark findings constantly gain media attention. Discoveries, that at first glance seem conclusive, nevertheless first require detailed scientific verification before one can enthusiastically speak of evidence for the credibility of the Bible. It seems the greater the importance and significance of the expected archaeological find, the greater the creativity of counterfeiters and fraudsters becomes. Spectacular reports in the media should, therefore, be first addressed with patience and »a wait and see« policy, until they can be confirmed by independent scientists or, as so often must be filed away. An alternative candidate for Noah’s Mountain and the resting place of the Ark is incidentally, »Mount Cudi« in south-eastern Turkey. According to different testimonials and archaeological traces, visible remains of the Ark could have survived here into the 8th century AD. This mountain also belonged to Urartu and thus to the biblical »Land of Ararat« and moreover bordered directly on the Mesopotamian plain, where historically, the first known civilization of humans existed. The date of the Great Flood, as derived from the biblical chronology and compared with historical data, must have been sometime between 3200 and 4000 BC. How can the origins of human races, nations and animal species be explained with reference to the Great Flood? If we adhere to the biblical narration, then not only are all human descendants of Adam and Eve, but also from Noah and his wife - because all the other humans, who lived before the Great Flood, were killed because of it. Aside from Noah’s three sons, their wives probably carried blood of other tribes in them, and thus saved a broad spectrum of genetic material beyond the Great Flood. Genesis 10 states that Noah’s sons reproduced, and also which nations stem from them. Although, in many cases it is only a presumption to find parallels within historically documented nations, from a biblical point of view, it is clear that humans of all colours and creed derived from these three pairs of people. Perhaps thereafter there was cross cultural pairing, nevertheless, following the next major event in early human history, the building of the Tower of Babel, the families or tribes were isolated from one another and different groups of people emerged: black Africans, fair-skinned Scandinavians, almond-shaped-eyed Asians, Australian Aborigines and many more. According to evolutionary scientists the »equine species«, for example, are considered to be basic types from which donkeys, horses and zebras evolved. Is the story of the Great Flood in the Bible at all realistic? »Did all the animals fit into the Ark?« The »Studiengemeinschaft Wort und Wissen« (lit. »Association of Studies of Word and Knowledge«), which deals especially with the conflict between science and faith, contributes to this interesting question in the form of a discussion: The Ark was not a small boat, but a large crate with dimensions of approximately 150 x 25 x 15 m. It was, therefore, longer than a football field and had ample space on three floors to house animals. »Until 1850 there was no ship in the world’s history that was bigger than the Ark«, said Prof. Dr.-Eng. Werner Gitt in the book »The Most Peculiar Ship in the History of the World«. The shape of the »crate« is not described further.